Parmesan, Pesto and Chicken. Just those three words alone are enough to make me salivate. Put them together in a creamy sauce and wow! It’s so simple to make, and yet I’d pay top dollar for this dish in any top restaurant. If you can make the pesto yourself, all the better, you can check out my pesto recipe, it’s so easy. If you’re time poor then you can also buy it, it will still be an amazing dish. Serve it with pasta and boiled or steamed green vegetables. The sauce will coat everything rendering it amazing, enjoy! Preheat oven to 350°F – 180°C. Season your chicken breast on each side with salt and pepper. Place a frying pan on medium to high heat with the olive oil. Once the oil is hot, place the breasts top side down first. Cook the breasts until they caramelise nice and brown on each side. They will still be raw in the middle, that’s fine. Turn down the heat, deglaze the pan with the white wine (be careful it doesn’t flambe unexpectedly). Add the cream and season with salt and pepper. 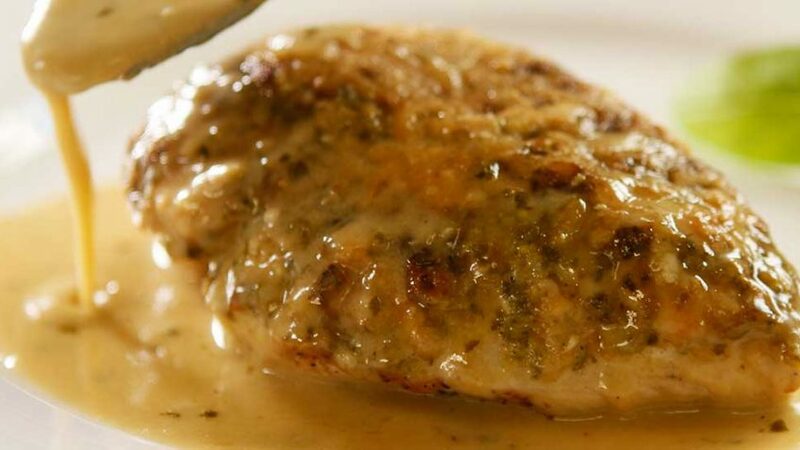 Top each breast with one and a half tablespoon of pesto. Then top each breast with the grated cheese and lightly tap on top to push the cheese into the pesto a little. Turn the heat back up, once the sauce starts to simmer, place in the oven and bake for 20 to 25 minutes at 350°F – 180°C. Remove from oven, heat up your serving plates, remove the breasts from the sauce and place on the plates. Reduce the sauce in the frying pan on full heat until it thickens to the right consistency. Pour over the breasts and serve. Serve with pasta and boiled or steamed vegetables.